The 10th Edition continues this tradition with coverage of emerging trends in Mobile Computing and Commerce, IT virtualization, Social Media, Cloud Computing and the Management and Analysis of Big Data along with advances in more established areas of Information Technology. Dr. Efraim Turban obtained his MBA and Ph.D. degrees from the University of California, Berkeley. His industry experience includes eight years as an industrial engineer, three of which were spent at General Electric Transformers Plant in Oakland, California. He also has extensive consulting experience to small and large corporations as well as to governments. In his over thirty years of teaching, professor Turban has served as Chaired Professor at Nanyang Technological University in Singapore, and University of Science and Technology, in Hong Kong. He has also taught at UCLA; USC; Simon Fraser University; Lehigh University; California State University; Long Beach; and Florida International University. Dr. Turban was a co-recipient of the 1984/85 National Management Science Award (Artificial Intelligence in Management). In 1997 he received the Distinguished Faculty Scholarly and Creative Achievement Award at California State University, Long Beach. Professor Turban is currently on the faculty of City University of Hong Kong, Department of Information Systems, Faculty of Business Administration. 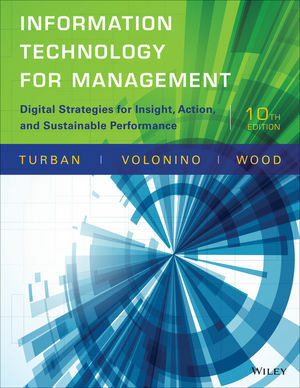 Professor Turban's current major interest is electronic commerce, strategy, and implementation. More Project Management with Templates: Students are given templates for writing a project business case, statement of work (SOW), and work breakdown structure (WBS). Also, critical project management issues include the following: project post-mortem, responsibility matrix, go/no go decision factors, and the role of the user community. New Technologies and Expanded Topics: With more purchases and transactions starting online and attention being a scarce resource, students learn how search, semantic, and recommendation technologies function and improve revenue. The value of Internet of Things (IoT) has grown significantly as a result of the compound impact of connecting people, processes, data, and things. Easier to Grasp Concepts: With models and text graphics for each opening case (the authors’ version of infographics) learning is easier and longer-lasting. Each chapter contains numerous case studies and real world examples illustrating how businesses increase productivity, improve efficiency, enhance communication and collaboration, and gain a competitive edge through the use of ITs. Faculty will appreciate a variety of options for reinforcing student learning, that include three Case Studies per chapter, including an opening case, a business case and a video case. IT at Work boxes spotlight real-world cases and innovative uses of IT. Career Insight boxes highlight different jobs in the IT for management field. Analyze and Decide questions help students apply IT concepts to business decisions. WileyPLUS: WileyPLUS is an innovative, interactive online environment that supports positive learning outcomes by providing a variety of study tools and resources for your students. For you, WileyPLUS offers a solution for teaching with current, engaging and relevant content quickly and easily.